Sven Väth’s Cocoon label now turns attentions to Ibiza for its next double disc mix release. Artists at the helm are long time associate Ilario Alicante and new signing Alejandro Mosso, the first of whom offers a mix that is basically the sound of summer in Ibiza, whilst Mosso offers up a live set made entirely from his own productions and remixes. 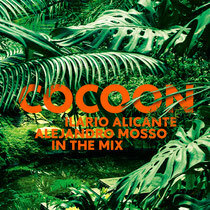 Italian Alicante has always been at the heart of the Cocoon family, with his Latin influenced and stripped back techno sounds a perfect match for the label. As such he’s the perfect choice to embody where the imprint is at in summer 2013. His mix starts with the deep and degraded house of LIES producer Terekke and progresses through some fairly cerebral, shadowy techno from the likes of A Sagittariun, New York’s DJ Qu and Romanian Cosmin TRG. The latter half of the mix explores more of a house vibe thanks to contribution from artists including Dance Mania’s Parris Mitchell, Omar S from Detroit and Manchester’s own Trus’ Me. South American Mosso meanwhile offers up plenty of exclusive tracks from his own catalogue. Before now he has released on his own imprint as well as Air, Meander and of course Cocoon, and his mix captures the very real energy and excitement of a night in a club. It starts with the moody, stripped but melodic micro house of ‘Selva’ and progresses invitingly and coherently through more textured techno, tight infectious rhythms and plenty of quirky synths. Plenty of live sounding elements pop up along the way, from strings to percussion to alien found sounds, all of which help to colour the grooves. There are many highlights, from the emotive stabs of ‘Unreleased’ to the kinetic kicks of ‘Grinding Love’. It’s out now.